Crypt0r is a new ransomware family which was analyzed by Carbon Black security researchers. According to researchers, the new strain of malware is relatively similar to the infamous WannaCry and NotPetya ransomware viruses because it has multiple similar functions, as well as implemented EternalBlue exploit. After performing multiple modifications to system files, Crypt0r ransomware scans the device for personal files, such as .jpg, .mp3, .avi, .html, .doc, .txt and many others. Once detected, the malware encrypts the data with the help of RSA and AES encryption algorithms and modifies files, making them unusable. To recover the access, victims are urged to contact cybercrooks via decrypt0r-help@protonmail.com – the email is included inside the ransom note _HELP.txt, which is dropped into each of the affected folders. Crypt0r virus uses a random generator for file extensions, for example, .qqjuBOaf, .2lwnPp2B, or .aqhATfjK. In the first stages of the infection, Crypt0r ransomware copies notepad.vbs file into the Temp folder. It contains instructions written in Visual Basic script language and is later executed with the help of cmd.exe process, consequently removing Shadow Volume Copies. Due to this, users are unable to recover personal files after Crypt0r ransomware removal. After system modification, Crypt0r ransomware contacts the C2 server with the help of eleven hard-coded .onion addresses via TOR network. It attempts to connect to the remote server in an endless loop until the connection is established, and then sends victim's ID and the encryption key to hackers. All your files and documents are encrypted by Crypt0r. Experts do not recommend contacting cybercriminals, as they might simply ignore victims, even after the payment in Bitcoin or other cryptocurrency is transferred. Additionally, such act would prove Crypt0r ransomware authors that ransomware works, and it will consequently encourage them to produce more dangerous viruses. 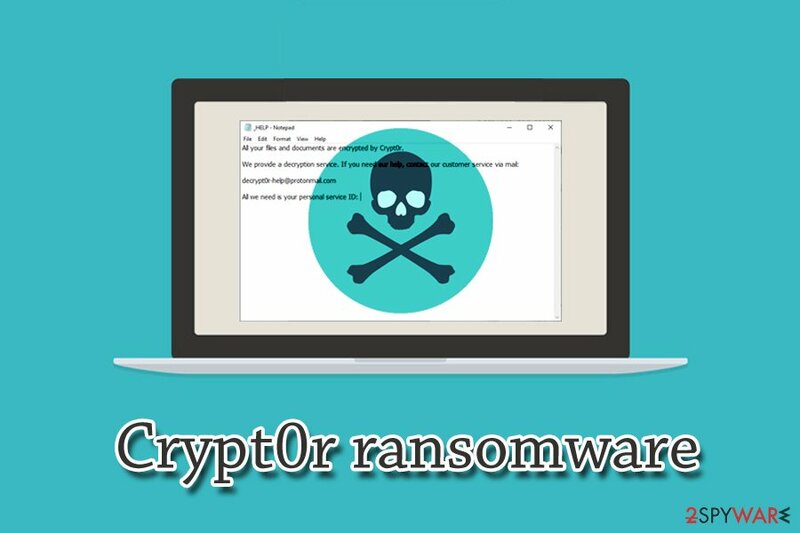 Therefore, you should remove Crypt0r ransomware from your computer as soon as possible, and only then proceed with file recovery. You can use anti-malware software that is capable of detecting the threat – we recommend using Reimage pr Malwarebytes MalwarebytesCombo Cleaner. While there is a low chance of recovering your data without a personal key or backups, you can always try third-party software. Additionally, security researchers are always working on free decryptors, and new tools are being released for different ransomware viruses over time. Lastly, Crypt0r ransomware is equipped with the EternalBlue MS17-010 exploit, which was also used by WannaCry. Exploits allow cybercriminals to execute code remotely, so patching your software is essential. Ransomware developers typically use multiple different distribution techniques to ensure the virus will affect as many victims as possible. Therefore, while browsing the internet, there are several things to look out for in order to avoid unwanted infections. One of the best-known tactics to deliver ransomware is spam emails. Crooks often employ bots to send out thousands of phishing emails to potential victims. These messages either include a contaminated attachment or a malicious link. Therefore, be careful with all the emails from unknown sources – open them if you are sure they are legitimate. Another ransomware distribution method which is becoming increasingly popular among cybercriminals is brute-force attacks. 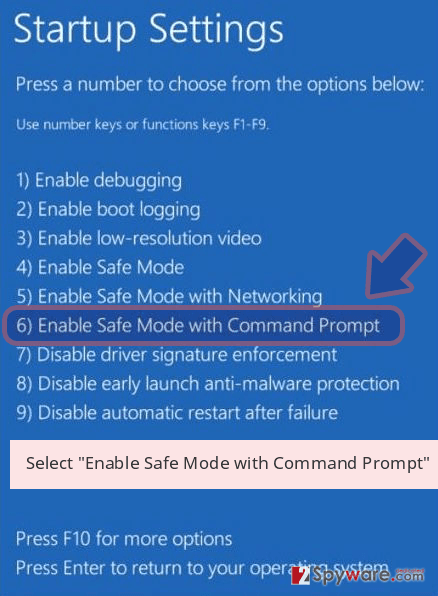 They use a preset list of most commonly used passwords and use a Remote Desktop Protocol to inject malware manually. Thus, use secure passwords an all your accounts, and also make use of a VPN. Avoid internet connections that are not secured (HTTP instead of HTTPS). Be aware that ransomware viruses can also travel with the help of backdoor- a specific malicious software that is created to download and install other malware, such as ransomware. For that reason, Crypt0r virus might be not the only infection present on your machine, which can result in personal information disclosure or even identity theft. 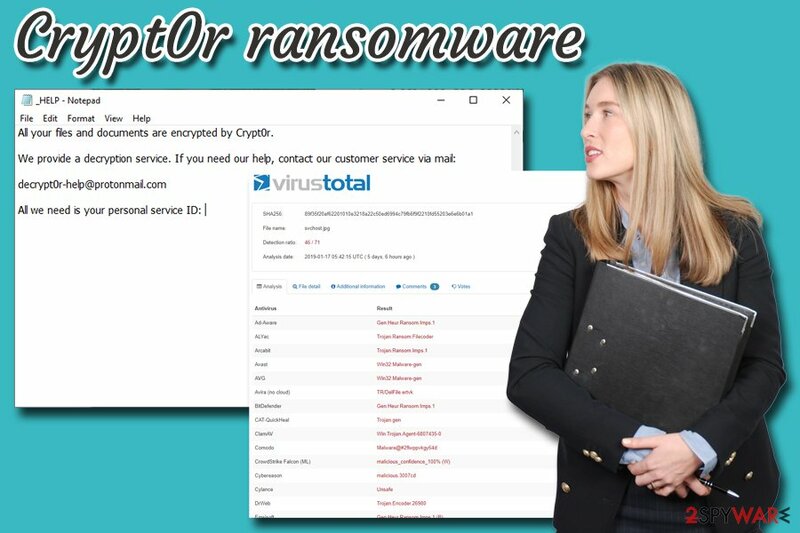 Thus, do not risk it and scan your device with reputable anti-virus software – it will be able to detect all the infections and remove Crypt0r ransomware in the process. 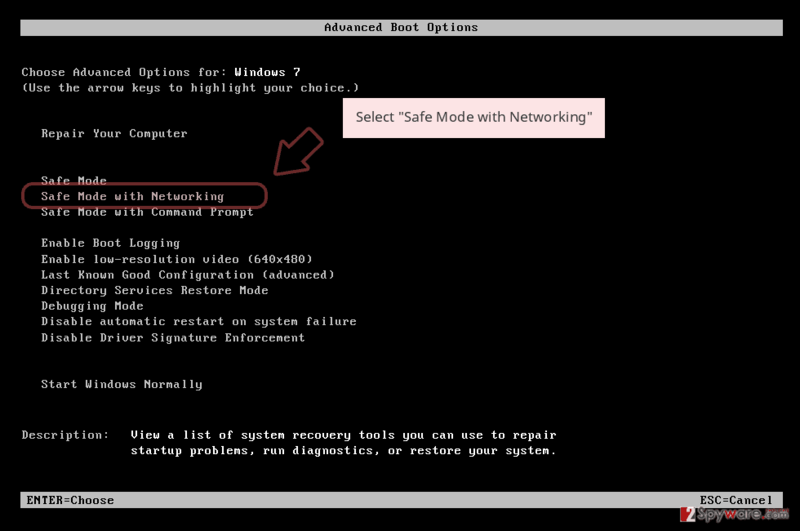 Note that malware can hinder the operation of security application. 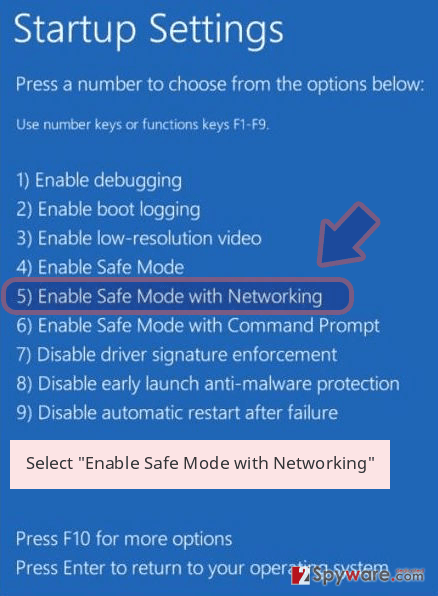 In such a case, enter Safe Mode with Networking and perform Crypt0r ransomware removal from there. Log in to your infected account and start the browser. Download Reimage or other legitimate anti-spyware program. Update it before a full system scan and remove malicious files that belong to your ransomware and complete Crypt0r removal. 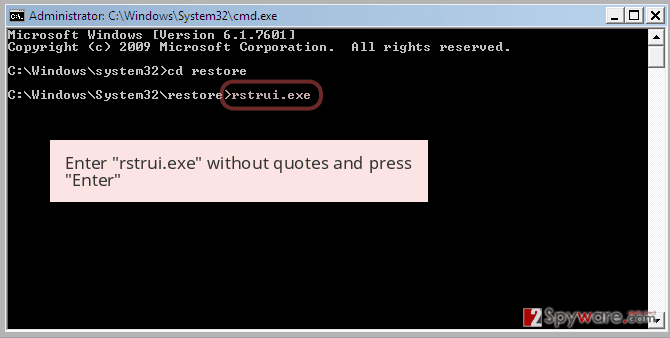 When a new window shows up, click Next and select your restore point that is prior the infiltration of Crypt0r. After doing that, click Next. 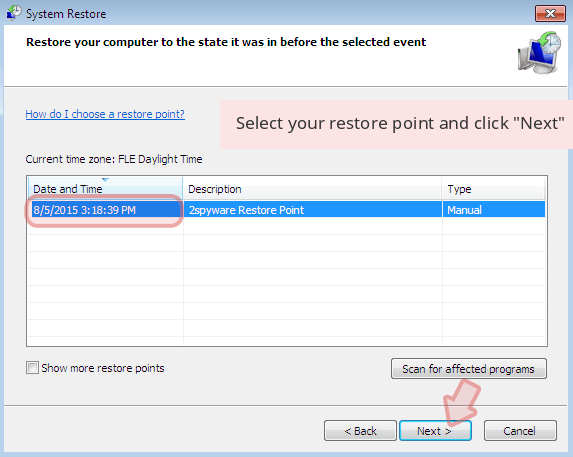 Once you restore your system to a previous date, download and scan your computer with Reimage and make sure that Crypt0r removal is performed successfully. Guide which is presented above is supposed to help you remove Crypt0r from your computer. To recover your encrypted files, we recommend using a detailed guide prepared by 2-spyware.com security experts. Initially, Data Recovery Pro is created to recover accidentally deleted or corrupted files. However, researchers noticed that it could sometimes help users whose data were affected by ransomware. 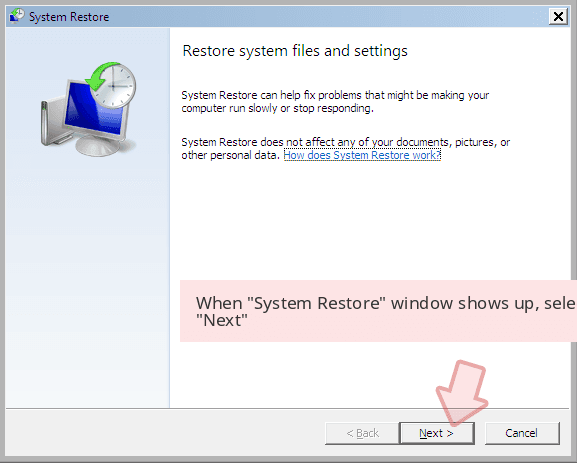 The method requires you to have System Restore enabled (before the infection), and it can also restore individual files, so recovery of large amounts of data might be impossible. As we mentioned above, ransomware performs Shadow Volume removal upon infiltration. However, the virus might fail to do so. Then ShadowExplorer will be able to recover all of your data. ^ TAU Threat Intelligence Notification – Crypt0r Ransomware. Carbon Black. Security researchers. 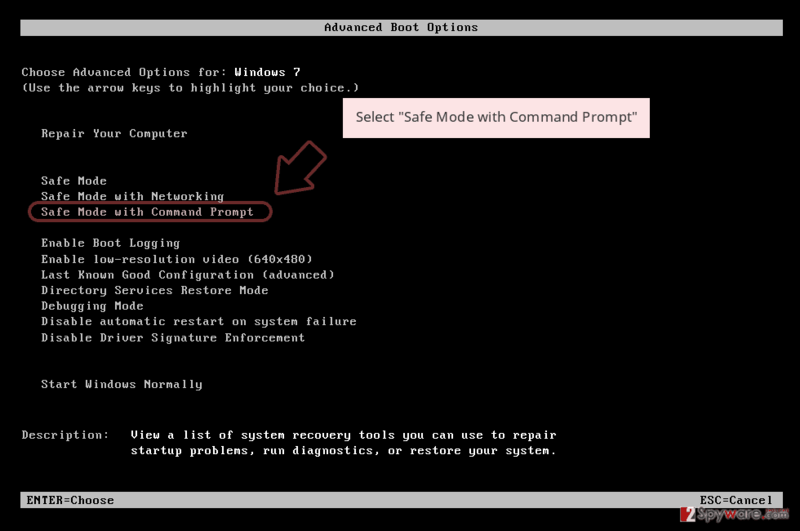 ^ Kashinath T. Command And Control Servers : Things You Should Know. SecPod. Endpoint Security and Management Platform. ^ 89f35f20af62201010e3218a22c50ed6994c79fb6f9f2210fd55203e6e6b01a1. Virus Total. File and URL scan engine. ^ Microsoft Security Bulletin MS17-010 - Critical. Microsoft. Docs. This entry was posted on 2019-01-22 at 07:27 and is filed under Ransomware, Viruses. You can quickly scan the QR code with your mobile device and have Crypt0r ransomware manual removal instructions right in your pocket. How did you remove Crypt0r virus?